Found this on one of my favorite Phillies sites, 'We Should Be GM's" very nice! 1. 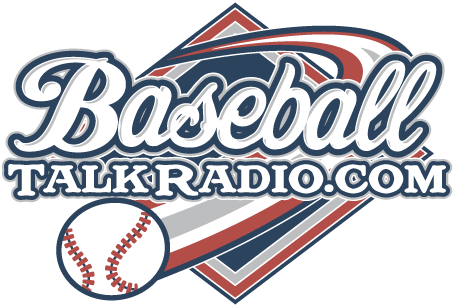 What is your prediction now that the Phils and the Yankees are tied 1-1 in the World Series so far who will win it? I'm thinking Yankees in 7. Yankees win game 3, Phillies game 4, Phillies game 5, Yankees game 6, Yankees game 7. 2. Who will finish better batting now that they've both had two games into the Series : Ryan Howard or Alex Rodriguez? Alex Rodriguez. No one has been clutcher or better this postseason and he has to break out of it eventually. Howard will be good in the rest of the WS also, I think. 3. Phillies or Yankees who has the better food at the stadium? Never been to Citizen Bank, but in my opinion the food at Yankee Stadium is average. I give it a 7/10. Lots of choices, but high prices for medium quality. 4. What team will finish the series with more home runs? I am actually going to choose the Phillies. I think with all their lefties and the short forch in right for Yankee Stadium they will hit more. 5. Who will get MVP of the Series? Going with a different choice than I ever expected. I'll give two choices. A.J. Burnett and Mariano Rivera. If Rivera keeps getting 2 inning saves then he will win it, if he only gets one I go with Burnett who will pitch well in his second start. 6. "New York, New York" or "Philadelphia Freedom" what is the better song? Gotta go with New York, New York. Gotta love Sinatra. 7. Who's better Jorge Posada or Carlos Ruiz in this World Series? So far Ruiz in my opinion. By the end of the series I think it will be a tie. 8. Lee or Sabathia who's better, who's best? I say Lee is better this postseason but if you give me one pitcher for the next 10 seasons I would pick CC without hesitation. 9. Should the Yankees and the Phillies play more interleague games? Personally, I like the current system. I don't mind interleague, but more interleague games would make it too much. 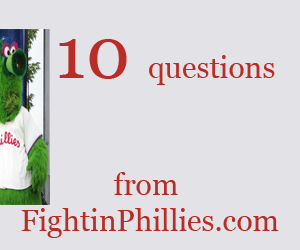 10. Who is your favorite Phillies player of all time and why? Jim Thome. Kind of random, I know but I have always respected him and he is one of my favorite non-Yankees. 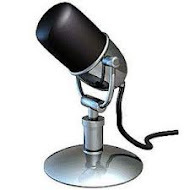 Thanks Brandon Cohen for your thoughts shared on this blog! Last night's Game 2 had all the ingredients for a possible great night for the Phillies. The Phils won Game 1 in New York, and now they had a tremendous opportunity to take a commanding lead in the series being up 2-0. They could not get it going offensively though, and opposing pitcher, AJ Burnett, looked like he had the best stuff of the postseason in the Yankees 3-1 win. Pedro Martinez pitched a good game for the Phillies, he did give up two homeruns and that was the difference in the game, as the Phillies couldn't answer with anything back. On Philly sports radio this morning, the talk was about whether or not Pedro should have been left in, I don't think that's even an issue. Pedro did fine, it was the Phillies offense that couldn't get anywhere against Burnett that made the difference. The bats need to become involved again for the Phillies or they will not be successful against this Yankee team who themselves haven't even displayed all of thier offensive power. Game 3 is a pivitol game, the series in effect is down to a best of 5 now and the Phillies have 3 of the five games possible at home. The Phillies left 6 runners on base in Game 2 and they only managed one run, they'll have to do much better than this in Game 3. If the problem is offense, the team will have to sacrifice bunt to move runners or whatever they have to do to move them and score them. That is one area where Charlie Manuel doesn't exert his managerial moves too much. He's going to have to start if the offense is still puttering around. Except for Chase Utley's two homeruns in game 1, the offense has been flat. Game 3 is on Halloween night, hopefully it will be a treat for the Phillies! This is a side note of Game 2 but it was reported that a dozen or so baseball writers were locked in a stairwell for up to 15 minutes so George Steinbrenner could leave undisturbed. This is bizarre, certainly no way to treat people in this day and age. Steinbrenner may own the Yankees but he isn't living god or anything, isn't this like false imprisonment or something for these writers? No introduction necessary, and that’s what the Phillies got last night at Yankee Stadium. Usually at a championship game, both starting teams are introduced to the crowd but for some strange reason, the Yankees just wanted the Phillies to just come out on the field all together in one of the strangest pregame introductions I’ve ever heard. To the music of Star Wars, the night was started at ‘new’ Yankee Stadium last night. I think they wanted to create a certain mood with this, but on tv, it came off as cheap and not what you would expect from a Opening night at the World Series. The Phillies started right out with loading the bases out of the gate in the first inning, they couldn’t get anyone home though as some of the week off may have contributed to some rust that was lingering on the team. It was a real great start to the World Series for the team though. C.C. Sabathia didn’t look as sharp as he had in the rest of the playoffs, and the Phillies really handled him well. Chase Utley battled C.C. in both at bats in which he hit out of the park, he had 2 strikes on him for both homeruns that he hit. Suddenly it looks for the moment that all the writers at ESPN that picked the Yankees should maybe reconsider their profession. Just about every columnist at ESPN.com picked the Yankees to win it all. The Phillies haven’t won it all yet, but they made a bold statement last night in the win in New York. The rain moved out of the New York area yesterday afternoon, but some mist still lingered around for most of the game. It made the stadium a damp and cold place to be on a Wednesday night, especially for the home town Yankee fans that saw their team lose the opening game of the Series. It was the first start in a World Series game for each starting pitcher last night, both C.C. and Cliff Lee made their first ever World Series starts. Here’s what Cliff had to say about this, "It's been a long time since I've been nervous playing this game, I've been doing this my whole life. It's what I do." So if Cliff had butterflies, he didn’t show them, as he dominated the Yankee bats all night. Charlie Manuel talking about Lee’s start said, "If you want to know the truth, I knew he was good when we got him, but I didn't know he'd be as good as he's been." Cliff had 10 SO and a CG on the night for the win for the Phillies. Chase Utley powered the offense last night. His errors in the NLCS seemed to have vanished and never to be seen again with that performance he put in last night. We’ll see who comes up big for the Phillies tonight as Pedro Martinez will start for the Phillies and it shows just how big these two acquisitions have been for the Phillies this year. but here is the results up to date, thanks to Baseball-Reference.com! For 2001, PHI won 1, BLA and NYY won 2. For 2006, PHI won 1, BLA and NYY won 2. 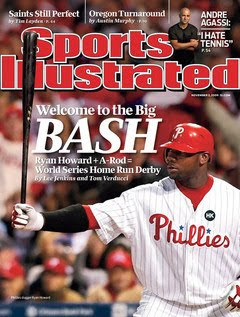 For 2009, PHI won 2, BLA and NYY won 1.